When bickering as to whether The United States of America is a republic or a democracy, we are discussing nothing more than liberty versus tyranny. However, stressing the difference between a republic and a democracy does not portray the motivations behind the conversion of our republic into a democracy. It is no coincidence that our system of government, initially founded as a republic, is now transforming into the depths of a democratic abyss. Essentially, our republic is able to maintain itself as a rule of law and not of men by means of a system of checks and balances. Separated into three branches, Legislative, Executive, and Judicial, our government is arranged according to the U.S. Constitution so that each branch has its own assigned powers. Examples of these powers are: to make laws (Legislative); to carry out the laws (Executive); and to interpret the laws (Judicial). The Constitution also provides each branch of the government with several checks over the other two. For example, the president can veto a law passed by Congress; however, Congress can override a veto with a two-thirds vote. As another example, the president is given the power to appoint Supreme Court and other federal judges; however, the Supreme Court can judge presidential actions to be unconstitutional. While our republic has built-in checks on government power, a democracy is based on majority rule with no such built-in checks. This defect of democracies is often referred to as “the tyranny of the majority,” because the rights of minorities and individual citizens are not protected in a democracy. Democracy, as the average citizen believes it to be, is a form of government by which all eligible citizens may have an equal say by vote to elect those who pass the laws that affect them. This is a reassuring definition from which a person could wrongfully believe that their individual rights will be protected in a democracy. However, democracy is far more than as defined above. “…democracies have ever been spectacles of turbulence and contention; have ever been found incompatible with personal security or the rights of property; and have in general been as short in their lives as they are violent in their deaths.”-James Madison, father of the Constitution. While democracy may seem to give people more say in their individual lives, it actually gives the government more control over the people. When a government may confer rights at any time, they can also take those rights away at any time. It is extraordinarily difficult to decipher exactly which rights we take for granted in our everyday lives that have an alternative intention. In alliance with the greater agenda of the elites as well as the shift towards a democracy, many beneficial laws and ideologies are being abandoned. The destruction of morality, banishment of private property, and abolishment of family are just a few of the major alterations. The destruction of morality should be viewed as being a great threat to our republic. Whether discussing homosexuality, abortion, or marriage, each and every campaign for equality rights, gay rights, and even women’s rights is cleverly disguised. The true intention of these campaigns is not to grant personal freedom or rights, it is to completely destroy man’s consciousness. Furthering our destruction of society, the banishment of private property is another mandatory aspect of doing away with freedom. Finally, the abolishment of family is along the same lines as destruction of morality. It is of the utmost importance to those who intend to rule us to control the household and the education of children in today’s society. By restricting homeschooling or allowing a child to have two mothers or fathers rather than a mother and father respectively, the traditional family is being deemphasized. Rather than our educational system teaching kids how to think critically, our children are now attending school and being taught what to think. Programming our children in inappropriate ways, our educational system has gone astray. One of the greatest assets of The John Birch Society is the archive housed at headquarters in Appleton, Wisconsin. Rows and rows of file cabinets and shelves filled with books, magazines, literature, and much more span many hundreds of square feet in the lower level of both buildings. JBS Founder Robert Welch was a prolific writer, and much of his work can be found in the archives. In October 1961, he wrote what is arguably the best description ever of the fundamental differences between a government based upon law and one based upon men. 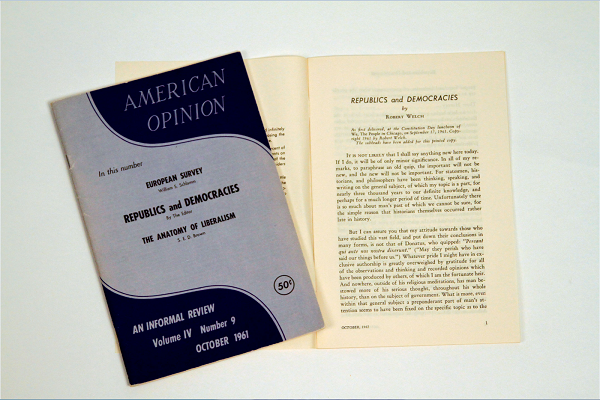 Published in American Opinion, his classic ‘Republics and Democracies,’ was first delivered as a speech on September 17 (Constitution Day), 1961.” The next month he published it in American Opinion.